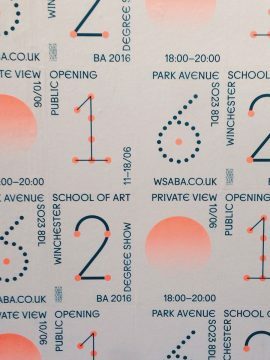 This year’s Degree Show at WSA kicked off with Friday’s Private View and is now open to the public in a week long display of talent across our Fine Art, Graphic Arts, Fashion and Textile Design and Fashion Marketing and Management programmes. The Degree Show is open from Monday – Saturday this week from 11:00-18:00 each day. Come along to celebrate the success of our 2016 graduates. You will also have the opportunity to admire our students’ hard work in upcoming shows in London. Click here to find out more about both the Winchester and London shows. « WSA Summer Ball – Cocktails, shots and magician now confirmed!